Luxor has finally done it: he has created an addicting online video game that puts dozens of kids (and even some parents) in a trance! And since the game is online, Luxor doesn't even have to be near the players to affect them. How will the Bibleteam counter Luxor's attack? Luxor Spawndroth has laid a clever trap for the Bibleteam. He knew they would rush in to help the children all across town who were stuck in a trance by his new video game. What is Luxor going to do next? Will the Bibleteam be able to escape the trap and save the game players? It looks like Luxor's plan is working. Will he finally be victorious? With his latest invention, the Ego Boost Ray, the Prince of Pride and his dull henchman are turning the middle-school champion athlete, Becky Thomas, into a painfully proud person. Can the Bibleteam reverse the effect? Jimmy and his older brother witness the Biblevan getting in to a traffic accident. But wait - was it really an accident? Uh-oh, the Master of Mean is on a rampage to destroy Bibleman and his entire team, and this villain doesn't care who he hurts or what he breaks in the process. Based on the Bible story Mephibosheth, this adventure offers a lesson in kindness. Nobody wants to be a patient of Dr. Fear, but that doesn't stop him from planting stop him from planting seeds of fear all over Whispering Pines Christian Camp. Will Bibleteam figure out why all the campers - and even the counselors - are paralyzed with fear in time to foil the Doctor's nasty plot? Based on the Bible story of Jesus calming the waves, this adventure offers a lesson in peace. Even his evil henchmen are afraid of the Crusher. But this most violent villain is also wickedly clever, luring Bibleman and Cypher into a deadly trap and using schoolkids as bait. 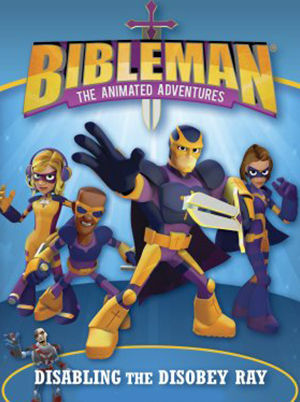 Can Bibleman rescue the kids before Crusher destroys them all? Based on the Bible story of Rehoboam, this adventure offers a lesson in gentleness. Nobody expects an English tutor named Baroness Fitzhugh-Ferguson to win a congeniality award. But her influence on the Woodson kids is awful: does she want to turn them against each other? 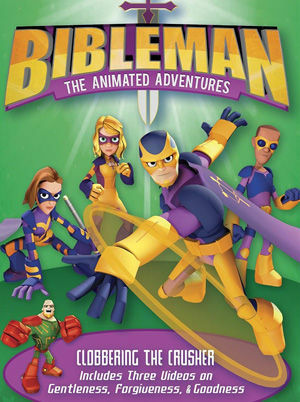 Bibleman knows she's a villain, but can he stop her before the family is ruined? Based on the Bible story of Jacob and Esau, this adventure offers a lesson in forgiveness. Talk about a knock-down-drag-out battle! 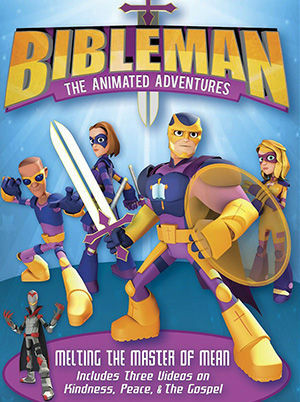 Bibleman is in a fight for his life - trapped in an underground tunnel with a ruthless, twin-sword-wielding villain. Yes, our man in purple chased the bad guy away from the community center opening ceremony, but should he have followed Ronin down here? Based on the Bible story of the Good Samaritan, this adventure offers a lesson in goodness. 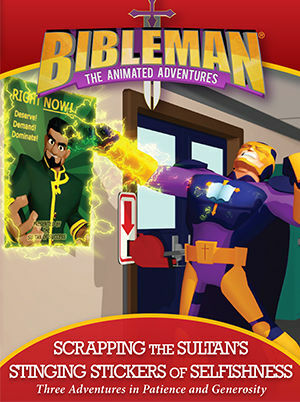 Disabling the Disobey Ray (An Adventure in Obedience): Let’s face it: Bibleman has a soft spot for Christian kids. And everybody knows it—including villain Luxor Spawndroth. So while it’s easy to lure the Bibleteam into rescuing kids in danger, the hard part for bad guys begins when the purple crew shows up. Will Bibleman be able to spot Luxor’s trap? Bible story: Adam & Eve. Key verse: Ephesians 6:1–2 2. Ambushed by the Ambassador of Ignorance (An Adventure in Wisdom): Some kids from Life Church unwisely posted videos of themselves pranking an elderly lady at the mall. Bibleman must find the mysterious “Iggy” person behind this mischief. Bible story: Wise Man/Foolish Man Parable. Key verse: Proverbs 1:22 3. Lighting Up the Shadow of Doubt (An Adventure in Faith): Cypher and Bibleman are going to jail!? Oh, they’re visiting some young men at a juvenile detention center. 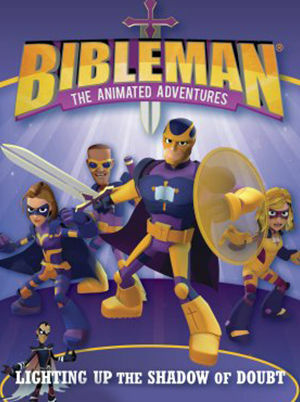 And Pastor Lewis is taking Logan there on Bible study day to visit his brother and meet Bibleman. Wait—who is that shadowy character in the waiting room? Bible story: Jesus & Peter Walk on Water. Key verse: John 8:12 2. Fracturing the Falsehoods of the Fibbler (An Adventure in Truthfulness): The new kid at school isn’t fitting in. But when some students start mocking her, she pours out a blizzard of words that totally intimidate everybody around her. Wait, why is the Bibleteam getting an alarm just because a young girl stands up to some bullies? Is there more here than meets the eye? Bible story: Ananias and Sapphira. Key verse: John 3:21 3. Wiping Out the Whiner Brothers (An Adventure in Thankfulness) Junior and Biggie Whiner complain about everything. Except money. They just LOVE money, and they have hatched a plan to get rich by uncovering a secret treasure: the location of the Bibleteam headquarters. Oh no—they’re using a newly-adopted boy from Africa to lead them there. Bible story: Jesus Heals Ten Lepers. Key verse: 1 Thessalonians 5:18.